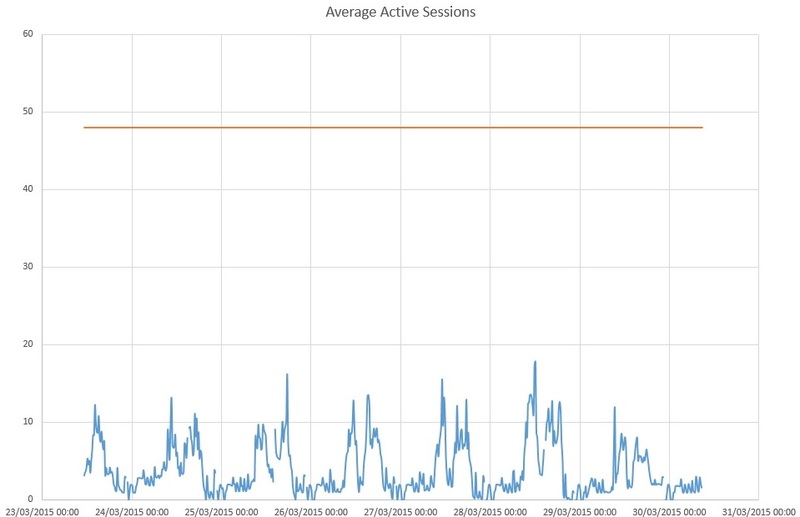 Active Average Session (AAS) is one of the first statistic you have to look when you analyze a performance issue. In Oracle Standard Edition (or Enterprise Edition without Diagnostic pack), you cannot query V$ACTIVE_SESSION_HISTORY and DBA_HIST_ACTIVE_SESS_HISTORY views, nor execute ashrpt script. If you have installed statspack and if you take snapshots, you can find Active Average Session between 2 snapshots. AAS is calculated with the formula : DB Time / elapsed time. So, if you have recorded a db time of 300 seconds in 900 seconds (elapsed time between two snapshots), AAS is 0,33. So it’s easy to calculate AAS between two snapshot, but the most important thing is to have AAS trending during a period. To do that, I wrote a small PL/SQL function based on SYS_TIME_MODEL_DIF function available in STATSPACK package definition (in spcpkg.sql script). Note that time is given in microseconds.